I don’t make pancakes too often, for no reason in particular. 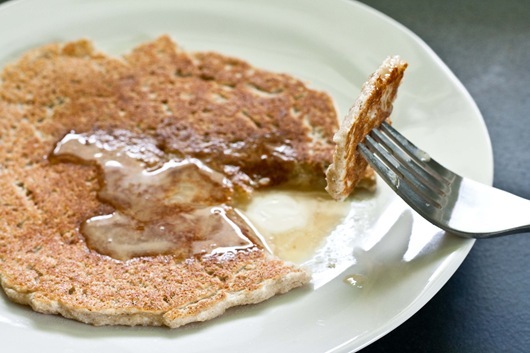 I’ll hassle with buckwheat bakes, and the stirring of steel cut oats, but pancakes are never consistently in my breakfast routine. Especially since going gluten free. I have one GF pancake recipe on the blog, but wanted one that was a little more traditional, in texture and taste. 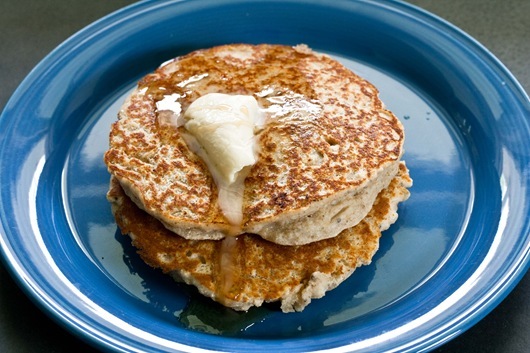 The Banana Coconut Flax Pancakes, also use up 3 of my lovely farm fresh eggs. That is 2, too many! They are light + fluffy, but don’t have that thick cake-like, pancake texture, that I love. I was wracking my brain, trying to think of what to make for breakfast today. Oats didn’t sound right, and I didn’t want to heat up the whole house making a buckwheat bake. I scoured the internet for gluten free pancake recipes, but didn’t find one that I was happy with. Some used too many flours + starches, some didn’t look appetizing, some used almond flour [which I don’t have], etc. While looking at the recipes, I tried to study the ratios of flour to liquid used. With gluten free recipes, every single one is different. Studying the recipes did no good. So I decided to wing it. Here were my thoughts. 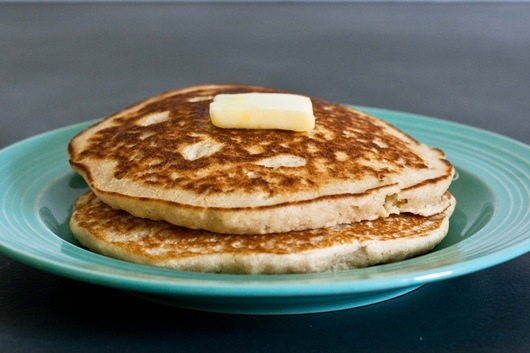 I know what the consistency of pancake batter should look like. I only want to use 1 egg. I want to make 1 serving pancakes. Recipes for 4 servings, seemed to call for 1/4c of oil, so I’ll use 1T. 1/2t baking powder sounds about right. Despite my thoughts, I was prepared for a total flop. But somehow, maybe because it’s Friday, the pancake fairies were on my side. 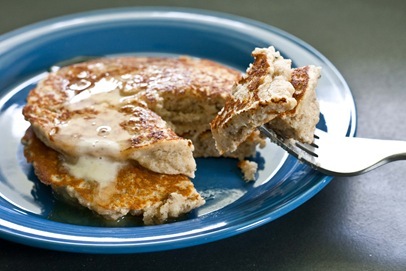 I’ve had rice flour pancakes before and while delicious, they were a bit gritty and a bit too thick. I decided to use oat flour, sweet rice flour + coconut flour for these pancakes. 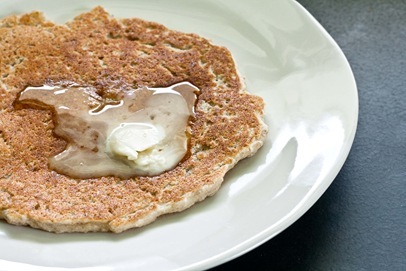 My thinking was that the oat flour would create a more traditional pancake texture, and the coconut + rice flour would keep them from becoming too heavy + give a nice sweet taste. The one egg method worked, as did eyeing up how much milk was needed for a nice thick cake. 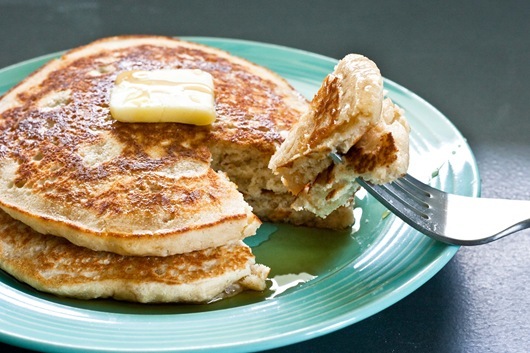 Pancakes, that if you’re gluten-free or not, you will love. 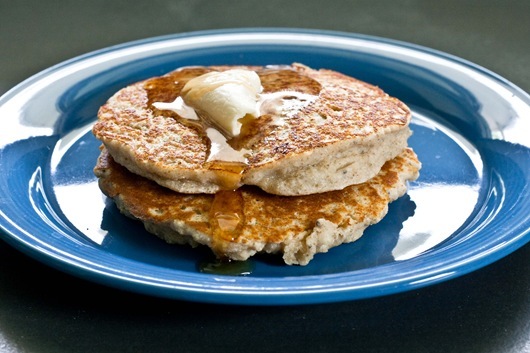 Now, don’t get me wrong, these are not 100% traditional tasting pancakes. They are ever so slightly coconutty, from the flour or oil. If you’re not into coconut, you can definitely just sub in more rice flour and use a different type of oil. In a small bowl, whisk together the wet ingredients, starting with 5T milk. Mix wet into dry, being careful not to over stir. The batter should be pourable, but not runny. If it’s too thick, add another 1-2T milk. If it becomes too runny, add 1T more flour. 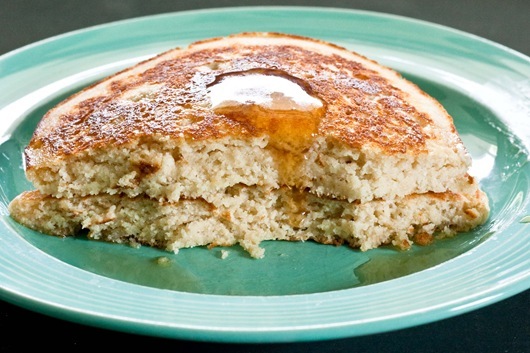 *If you don’t have coconut flour, or can’t find it, sub 2T more sweet rice flour instead. These were thick + cakey, not dried out + not crumbly. Pretty sure I did a little jump up + down in the kitchen, after the first bite. And the second. These didn’t need blueberries, or chocolate chips, just a little butter + maple syrup. Half way through eating, I realized I needed to take another photo, to better show you the texture. And add more maple syrup! Then I started to get greedy. I thought I could pull off gluten free + vegan pancakes. They may taste was good. But they just didn’t cook through all the way. It wasn’t too much milk, but that whole no-egg thing. Definitely will be working on this one! I basically subbed in 1T ground chia, instead of the 1 egg and added more milk, until it was pancake consistency. I know they look “done” here, but the inside was fairly raw. Using the same batter, I tried making a much thinner pancake. It was better, but still somehow not cooked through. Now, let’s just focus on that first recipe. 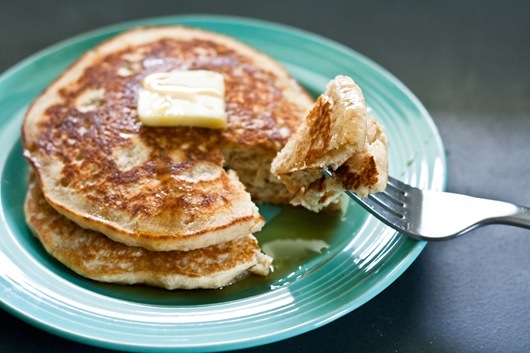 Yes, the fluffy pancakes, that were cooked through + delicious. Friday couldn’t have started any better! Unless maybe the construction on the house behind us didn’t start at 6:30am.